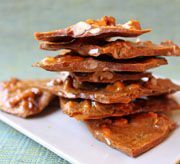 This walnut brittle recipe has loads of crunchy nuts, the deep, rich taste of caramelized sugar and a touch of molasses flavor. Don't skip the step at the end where you pull the brittle --our favorite part about this candy is how the impossibly thin sugar almost shatters when you bite into it! 2. Place the sugar, water, molasses, corn syrup, and salt in a medium saucepan over medium-high heat. Stir until the sugar dissolves, and brush down the sides of the pan with a wet pastry brush to prevent sugar crystals from forming. Insert a candy thermometer. 3. Cook the mixture until it reaches 270 degrees F (132 C) on the thermometer. Once it reaches the proper temperature, add the butter and the walnuts, and begin to stir constantly. 4. Cook the brittle, stirring, until it reaches 300 degrees F (149 C) on the thermometer. Immediately remove the pan from the heat and stir in the vanilla and baking soda. The brittle will foam up when you add the soda, so be extra cautious during this step. 5. Pour the candy out onto the prepared pan and allow it to cool for 4-5 minutes. 6. Once cool enough to touch but still warm and pliable, spray your hands with nonstick spray and begin to pull the candy gently between your hands, stretching it as thin as possible. 7. Allow it to cool completely, then break it into small pieces. Store walnut brittle at room temperature in an airtight container for up to one week.